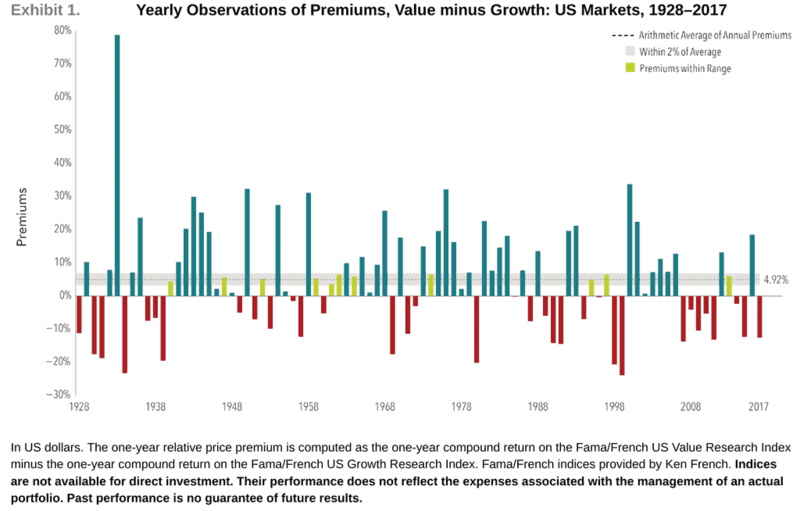 While never guaranteed, the value premium has historically had a greater chance of being positive the longer the time horizon observed. Periods of underperformance can happen, but a consistent approach that maintains an emphasis on value stocks in all market environments may allow investors to more reliably capture the premium over the long run. 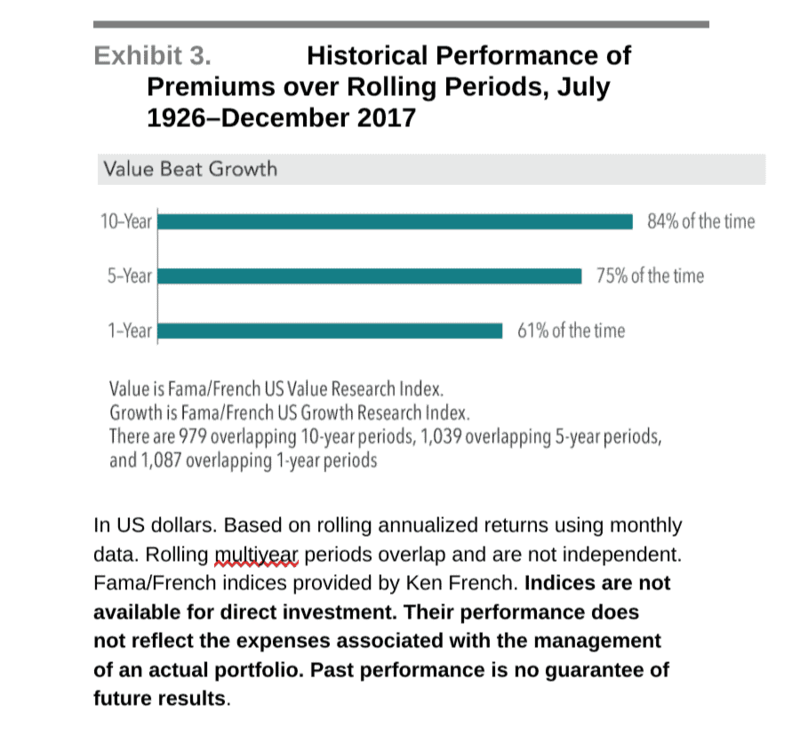 From 1928–2017 the value premium1 in the US had a positive annualized return of approximately 3.5%.2 In seven of the last 10 calendar years, however, the value premium in the US has been negative. This has prompted some investors to wonder if such an extended period of underperformance may be cause for concern. But are periods of underperformance in the value premium that unusual? We can look to history to help make sense of this question. 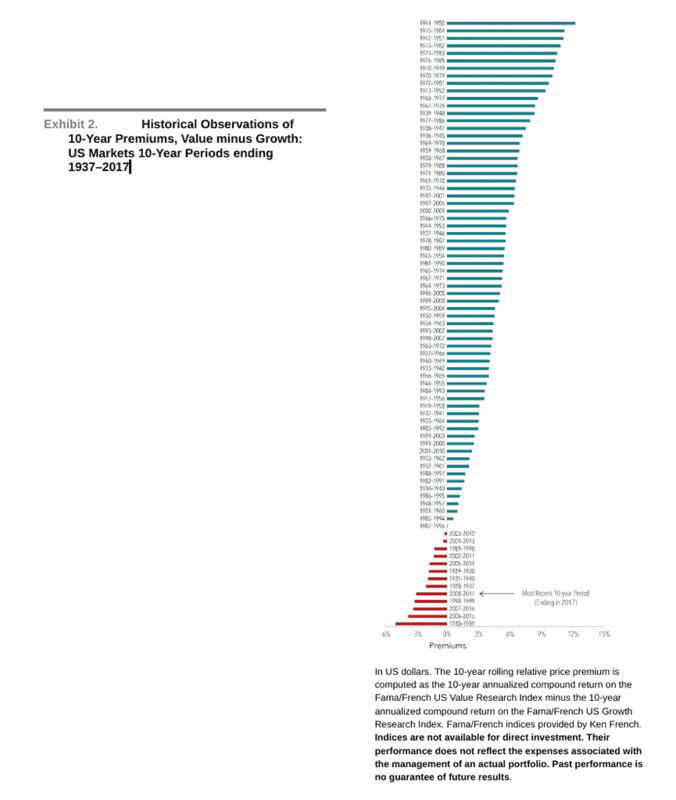 While there is uncertainty around how long periods of underperformance may last, historically the frequency of a positive value premium has increased over longer time horizons. Exhibit 3 shows the percentage of time that the value premium was positive over different time periods going back to 1926. When the length of time measured increased, the chance of a positive value premium increased. the consistency of expected outperformance. services to, Dimensional Fund Advisors LP. All expressions of opinion are subject to change. This article is distributed for informational purposes, and it is not to be construed as an offer, solicitation, recommendation, or endorsement of any particular security, products, or services. Investors should talk to their financial advisor prior to making any investment decision. Finley Wealth Management, LLC is an investment advisor registered with the State of Florida.